My newspaper had a review some days ago about the album “Calling the Muse – Old & New Pieces for Theorbo” by the French theorbo player Bruno Helstroffer. Bruno Helstroffer has studied the guitar in Straßburg in France and has also started to play the theorbo, the lute and the vihuela. The theorbo and the lute are now his favorite instruments. Helstroffer has played with different old music ensembles playing music of the Renaissance. 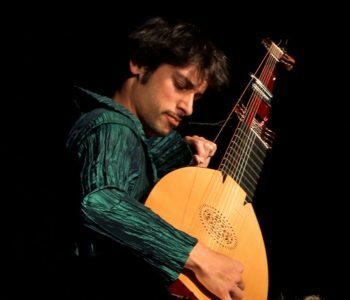 He has played solo performances with his theorbo and has a very creative way to play old and new music on the lute instruments. He is composing new music for the theorbo, arranging modern compositions for the lute and even plays arrangements of pop songs. Grégory Dargent, oud, Kevin Seddiki, guitare classique et Bruno Helstroffer, théorbe interprètent Pari Intervalo d’Arvo Pärt. Extrait du concert Ocora, Couleurs du monde enregistré le 10 septembre 2018 au Studio 105 de la Maison de la Radio. Stary Olsa is a medieval band from Minsk, Belarus that has played throughout Europe. As an experiment they have played classic rock songs by Metallica, Deep Purple or The Beatles using their medieval instruments – and they had a big success with their performances and their youtube videos. Now thay have just started a kickstarter campaign to produce their album “Medieval Classic Rock” – maybe you like to support this project? Folk Radio UK shares a so called Covermount Mix every month to the subscribers of the Folk Radio UK Newsletter. In the latest covermount mix I have discovered Kyrre Slind with the great track Oysterhaven from his latest album Open Airs. Kyrre Slind is originally from Norway, but he has been in Ireland for some years and now lives in Scotland and Norway. On his album Open Airs he has compiled a selection of tunes for the guitar and lute. You can find 4 tracks from this album on soundcloud. If you like music for the acoustic guitar and lute you should check this album! 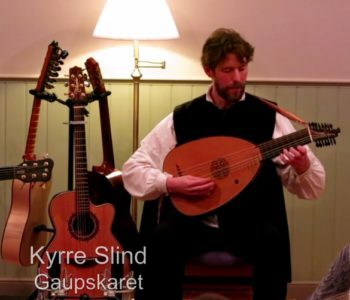 Kyrre Slind plays Lute, Banjo, Guitars, Mandolin and Sitar. Lives in Scotland and Norway. Plays solo and with Gerda Stevenson, and appears at local sessions. Open Airs is a musical log book of travels in Norway, Ireland and Scotland. In 2011, Norwegian musician and composer Kyrre Slind quit his job, bought a banjo and hit the road on a Vespa 125 scooter, heading for Ireland. 4 years later – rich in new experiences – he releases his first solo album Open Airs, recorded in Scotland and Norway. Subscribe to the Folk Radio UK Newsletter to get the monthly Covermount Mix! Last year friend told me a bout a great concert he had visited some time ago – a concert titled “Mediterraneo” played by Christina Pluhar and the ensemble L’Arpeggiata. 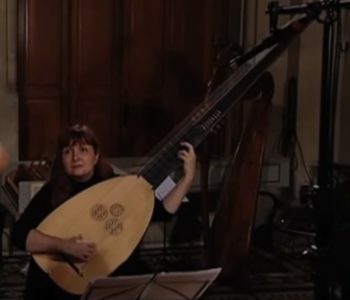 The ensemble used all kinds of plucked instruments including an instrument with an extremly long neck – a theorbo. Christina Pluhar and the ensemble L’Arpeggiata have recorded several great CDs. You can find many videos from concerts from all over the world with examples from their program. I have compiled a playlist with my favorite videos. The first video in the playlist is from a concert given in Athens, Greece. 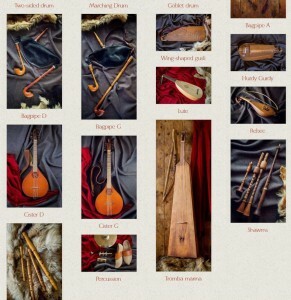 In this concert all kinds of plucked instruments have been used. This is a great example of how a concert with Christina Pluhar and L’Arpeggiata might take place. The music played by L’Arpeggiata includes old music (Via Crucis), folk music from the Mediterranean (Mediterrano), music from South America (Los Pajaros Perdidos). Instruments include the theorbo, the baroque guitar and baroque harp, oud, saz, baglama, Prtuguese guitar and other instruments. It’s really fun to watch those videos, beside the music you can see dance and movement, the musicians are very active, and you can see that they enjoy it very much to play the music. The latest CD – Music for a While – is dedicated to the music of Henry Purcell. This might be a great recording for the friends of the Elisabethean lute music of John Dowland and Thomas Robinson. My playlist contains some of the pieces form this CD at the end.